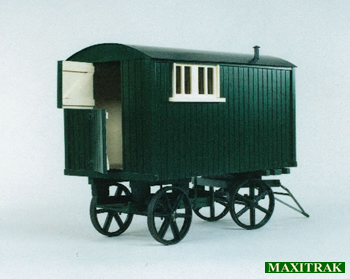 Our 1" scale living van is a scale replica of the vans used by traction engine crews for accomodation. They were a common site on farms during the threshing season as the crews worked long hours bringing in the harvest. The model is of ply and timber construction with cast bronze wheels. Intended as an accessory for the ploughing and agricultural engines these vans might also be seen as the tail end load on long distance haulage or indeed for any occasion where the engine crew were not expected to find a suitable hostelry and had to make an early start.